This is a less common term interchangeable with either ALT (Assistant Language Teacher) or a TA (Teaching Assistant). These teachers are typically native English speakers teaching in a Japanese classroom. This is a native English speaker typically serving as an assistant teacher for the JET Programme (Japanese Exchange and Teaching Program) in a Japanese classroom. The terms AET (Assistant English Teacher), ELT (English Language Teacher), and NESA (Native English Speaking Assistant) can also be used for this teaching role. This term refers to the basic English skills a student needs to be able to interact socially using the English language, and is typically achieved after 3 to 5 years of study. This is often referred to as “playground English,” and is commonly used in conjunction with CALP (Cognitive Academic Language Proficiency). The bilingual program model uses the student’s native language as part of ESL instruction. These programs are usually implemented in areas with a large number of students from the same background. This is English used in a Business context such as in the workplace, during trade agreements, within the finance industry, and any other business structures. As opposed to BICS (Basic Interpersonal Communication Skills), CALP is used to reference formal academic learning after the student attains basic skills in listening, speaking, reading, and writing. The terms BICS and CALP were developed by Jim Cummins to describe proficiency levels of language learners. This is a Cambridge University certification attained by teachers of English as a second or foreign language (ESL or ELL), particularly in European schools. This certification mainly focuses on the teaching of adult learners and is suitable for teachers interested in TESOL (Teaching English to Speakers of Other Languages) and TEFL (Teaching English as a Foreign Language). Otherwise known as sheltered immersion, this type of instruction, this is when educators bring English instruction directly into the general ed classes. Are when students work in small groups, sharing experiences while making connections between content and language. One of the most recognized TEFL examinations, this is a course giving for experienced and qualified ESL teachers hoping to advance their careers. Is when every student is learning the same thing but through different teaching methods and are taught as a group despite varying age groups and levels. This is for developing bilingual students by teaching them in both languages throughout their school-day, cultivating skills in both languages. This method requires a large pool of bilingual teachers and is frequently used by schools with a large group students speaking the same language. In EAL programs, non-native speakers of English seek to learn the language in addition to their native language. This term is very similar to ESL and EFL. Teachers of these programs share a first language with their students which can have a positive impact on the classroom. This method is when the first language is phased out rapidly, with most students mainstreamed to the regular classroom within the first two years. This system eliminates manual processes, cutting down on time waste, and allowing staff to manage time-consuming tasks in just a few seconds without risk. This term is used when students seek to learn and use English as an additional language in a country where English is not the primary language. These materials are often created for English learners who will be residing in an English-speaking country. It can be compared with ESL and ESOL, which typically refer to learning English as a new resident in an English-speaking country. This type of instruction is commonly used in the United Kingdom. This term has recently begun to replace the term ELL (English Language Learner) and has the same meaning and definition. English Learners are students studying English as an additional language, often in a country where English is the primary, native language. These are non-native English students, often residing in an English speaking country, who are seeking to obtain a proficiency in English. Educators commonly interchange this term with EL (English Learner) and LEP (Limited English Proficiency). ELLs are encouraged to bring their home culture into the classroom environment. This term is most commonly used in American classrooms. This is an English program model emphasizing reading, writing, listening and speaking in a classroom setting. This program is a guideline for young learners and is not typically associated with adult ELLs. This program assists any and all students whose native language is not English. An English Language Educator for all students seeking to learn the language. This is a generalized term referring to all types of English language teaching. This program is directed by the Korean Ministry of Education. These courses are for non-native English speakers of Korean descent and are instructed by guest teachers whose first language is English. This program is advertised as a cultural exchange between the teacher and student as well as being a language course. The ESL definition applies to students from a nation where English is not the native language who have moved, either temporarily or permanently, to a country where English is the native language. This is the difference between the ESL meaning and the EFL (English as a Foreign Language) definition. Students studying English in their own country or in a country where it is not the native language are considered EFL students. This is a variation of the pull-out design. This teaching method brings in students from different classrooms or even schools to a resource center for concentrated instruction. The ESOL meaning in the United Kingdom, New Zealand, Ireland, and Australia is similar to ESL or EFL in that is is also the instruction of non-native English speakers. These classes can be for students of any level but are commonly associated with adult learners and the instruction of Business English. This method is when teachers utilize typical elements of game playing, like scoring points or competing with others, to engage their students. If an ELL is anticipating attending a four-year university in an English speaking nation, this is the test they will be studying for. This is the internationally-recognized standardized test for non-native English speakers assessing all English skills in adult learners - reading, writing, listening, and speaking. This test is sometimes attempted for immigration purposes through computerized or paper versions. This method is when students combine various study branches for language practice, developing critical thinking skills in different academic contexts. While the IELTS is typically given to adults for work, immigration, or education purposes, the IDEA is a standardized English language assessment for children from age 3 all the way through grade 12. This test assesses the child’s reading, written, and oral English abilities. This is a large-scale government project in Japan that seeks to place ALTs worldwide into Japanese elementary schools, middle schools, high schools, boards of education, and government offices. This program is fairly prestigious and provides many benefits for the selected teachers from professional development to transitional support. This is an assessment program helping teachers determine the level group in which their ELL students belong. Teachers can purchase the LAS Links suite of assessment and instruction to monitor the progress of their students, or they can modify their own assessment materials to suit the needs of their classroom. These differ from early-exit programs. Students remain in the program, receiving nearly half of their instruction in their first language, even after they are classified as fluent in elementary school. This term is used primarily in the United States in reference to students who have minimal English ability and is often used in conjunction with the term ELL. These students are from nations where the primary language is not English. LEP is frequently used by the U.S. Federal Government during conversations about the Civil Rights of immigrants. This is a less common term interchangeable with either ALT (Assistant Language Teacher) or AET (Assistant English Teacher). These teachers are typically native English speakers teaching in a Japanese classroom through JET. This model works well in schools that are process-focused by either pulling students out of class for a period of time or having students receive ESL instruction during their general ed classes. Using this method, the teacher tailors a variety of lessons to fit the needs of ELL students for academic subjects like social studies, geography, and science. Instead of using English-only methods, this approach allows students access to lesson materials in their primary language as well as in English to help them gain English skills as well as knowledge of the subject. Otherwise known as Content-Based English Instruction, Sheltered Immersion brings English language learning directly into the classroom. ELTs and general ed teachers co-plan ESL instruction, connecting academic content and language learning. This model of instruction is used by teachers of ELLs to address these students linguistic and academic needs in all subject areas. There are eight building blocks for this type of teaching including preparation, building background, comprehensible input, strategies, interaction, practice/application, lesson delivery, and review/assessment. This is commonly obtained by teachers as a graduate certificate, and many universities offer this program worldwide. TEAL is one of the more prestigious realms of study within ESL and gives the teacher the credentials necessary to instruct at a university level. 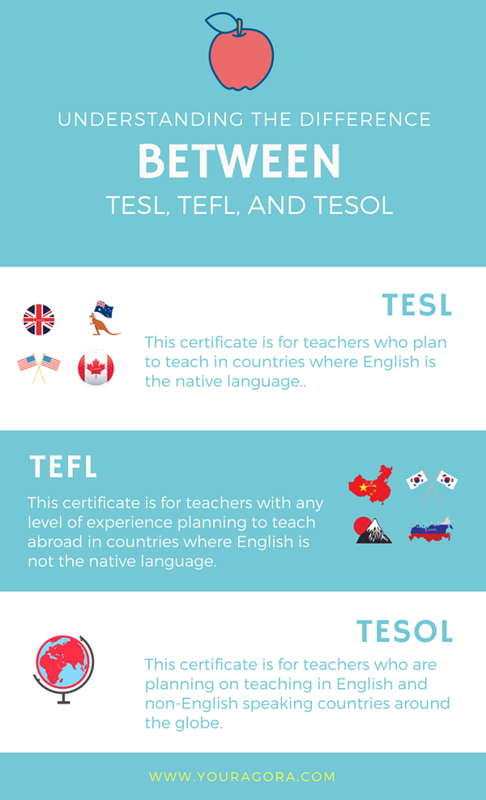 TESOL is often incorrectly interchanged with TESL, TEFL, and TEAL. This term is most commonly associated with the TESOL International Association, the largest international, professional organization for educators working with ELs. Teachers who attain a TESOL certification are intending to teach English to non-native speakers in a country where English is or is not the primary language. TESL teachers are English teachers for ELs whose primary language is not English. This term is commonly used in North America and is similar to TEFL. Teachers who attain a TESL certification are intending to teach English to non-native speakers in a country where English is the primary language. This term describes those teaching English to foreign students outside of a regulated governing body or a single representative school. Teachers who attain a TEFL certification are intending to teach English abroad to non-native speakers in a country where English is not the primary language. This standardized test examines the English abilities of non-native speakers who intend to further their education through programs within countries where English is the native language. This test is also accepted by many professional institutions and is the world’s second major English test, along with the IELTS. Unlike the TOEFL and the IELTS, this language test examines the everyday skills of ELs in either listening and reading or speaking and writing. The TOEIC Bridge test is also offered for beginner and intermediate learners to measure their strengths and weaknesses within the language. This language teaching method combines language learning with physical activity or movement during every part of the lesson. This method is particularly popular among online teachers. Students use all aspects of language within one activity - speaking, listening, writing and reading. One of the steps towards becoming a better educator is gaining a complete understanding of the industry in which you are working. This guide to ESL terminology should help you identify your next step by explaining which certification is right for your desired career path, allow you to properly design curriculum, find resources, and identify and name your student demographics. In the complex and dynamic world of ESL education, Your Agora allows educators from around the globe to communicate and share ideas through our collaborative teaching platform. Understanding terminology, testing, and program development is made simple through our intuitively designed platform made for teachers by teachers. Start growing your online ESL business on Your Agora today!